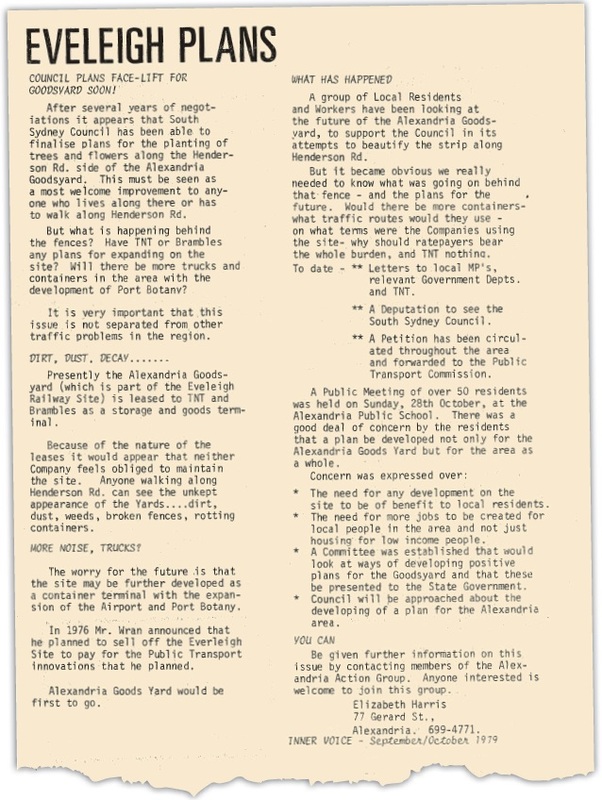 Alexandria residents in 1979 were worried about the impact of the Alexandria Goods Yard along Henderson Road on what is now the Australian Technology Park (ATP). They wanted to know the future of the former Eveleigh rail yards. A community meeting wanted any development on the site to be of benefit to local residents. Many plans later, in June 2014, UrbanGrowth NSW produced a new Concept Plan for the government owned Central to Eveleigh corridor including ATP and three building sites remaining from the old Alexandria goods yard. This is at www.central2eveleigh.com.au under the downloads tab. Community groups are unhappy with the level of consultation so far. Not surprisingly after 35 years the community still wants a say in, and community benefits from, any Eveleigh plans. After several years of negotiations it appears that South Sydney Council has been able to finalise plans for the planting of trees and flowers along the Henderson Rd side of the Alexandria Goodsyard. This must be seen as a most welcome improvement to any-one who lives along there or has to walk along Henderson Rd. But what is happening behind the fences? Have TNT or Brambles any plans for expanding on the site? Will there be more trucks and containers in the area with the development of Port Botany? It is very important that this issue is not separated from other traffic problems in the region. Presently the Alexandria Goods-yard (which is part of the Eveleigh Railway Site) is leased to TNT and Brambles as a storage and goods terminal. Because of the nature of the leases it would appear that neither Company feels obliged to maintain the site. Anyone walking along Henderson Rd. can see the unkept appearance of the Yards….dirt, dust, weeds, broken fences, rotting containers. The worry for the future is that the site may be further developed as a container terminal with the expansion of the Airport and Port Botany. In 1976 Mr. Wran announced that he planned to sell off the Eveleigh Site to pay for the Public Transport innovations that he planned. Alexandria Goods Yard would be first to go. A group of Local Residents and Workers have been looking at the future of the Alexandria Goods-yard, to support the Council in its attempts to beautify the strip along Henderson Rd. But it became obvious we really needed to know what was going on behind that fence – and the plans for the future. Would there be more containers – what traffic routes would they use – on what terms were the Companies using the site – why should ratepayers bear the whole burden, and TNT nothing. Letters to local MP’s, relevant Government Depts. and TNT. A Deputation to see the South Sydney Council. A Petition has been circulated throughout the area and forwarded to the Public Transport Commission. A Public Meeting of over 50 residents was held on Sunday, 28th October, at the Alexandria Public School. There was a good deal of concern by the residents that a plan be developed not only for the Alexandria Goods Yard but for the area as a whole. The need for any development on the site to be of benefit to local residents. The need for more jobs to be created for local people in the area and not just housing for low income people. A Committee was established that would look at ways of developing positive plans for the Goodsyard and that these be presented to the State Government. Council will be approached about the developing of a plan for the Alexandria area. Be given further information on this, issue by contacting members of the Alexandria Action Group. Anyone interested is welcome to join this group. ◄ What is Inner Sydney Regional Council?